Dema Simeri is a prolific quilling artist I enjoyed meeting a few years ago at a convention of the North American Quilling Guild. She's passionate about paper filigree and says she could easily spend all day working on new designs. 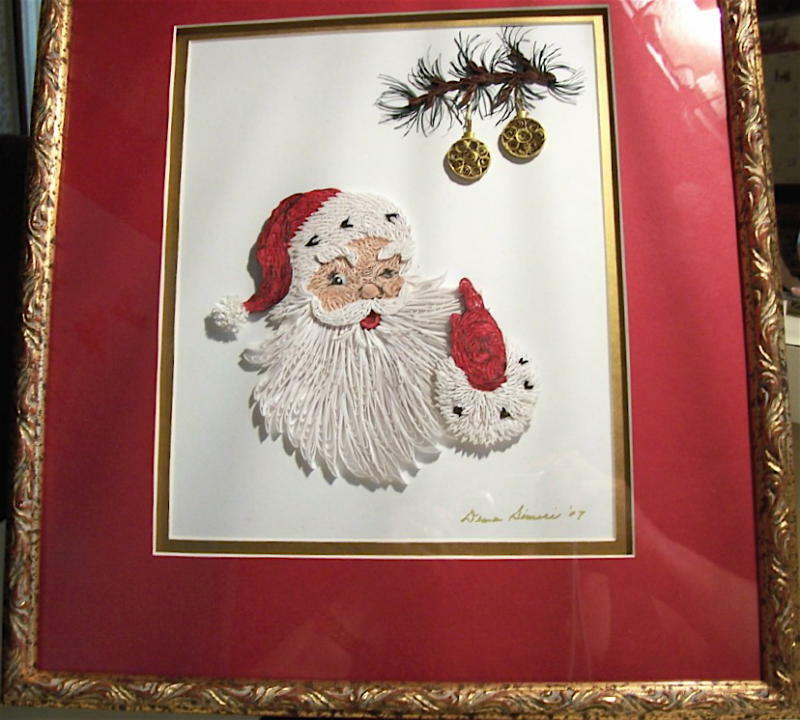 Dema primarily makes framed pieces to sell at Indiana art shows, as well as gifts for family and friends. Vintage Christmas card illustrations inspired her to quill these Santas. Dema sketched variations of the pictures and then used the outline/fill-in quilling method. Layering the various elements gives a 3-D appearance. For example, the tassel on the hat, eyebrows, nose, mustache, and gloved hand were initially separate pieces, and then were glued to the main body after it was completed. I really admire the way Dema is able to capture such lively expressions with simple coils of paper. Thank you for sharing this,it is beyond awesome! I have loved Dema's artistry since I have became a quiller. She has inspired me to practice and improve my quilling with her inovative, detailed and stunning designs and techniques. congrats to Dema, that is a fantastic quilled santa! !